With an annex garage/ office nearing completion the client wanted a standalone solution for the heating and hot water. The Worcester Bosch oil combination boiler provided the answer. 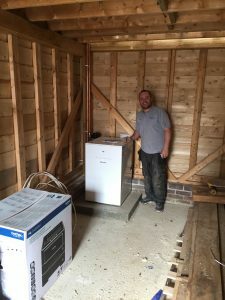 The boiler was connected to the main properties oil tank and had extra frost protection and a magnetic system cleaner which will protect the boiler and increase the warranty from 5 to 7 years. The condensate waste water was run through the wall and across underground to a limestone soak way and the heating was controlled via a remote wireless room thermostat.